What is the all-inclusive tempo traveller fare for our trip? And to answer this question, we have to do some simple math, and only then we quote the All Inclusive fare. Below we have shared, how you can your self-calculate that what will be the all-inclusive fare or maximum (not minimum) fare that you need to pay us for your trip. Kindly have a look at that, and if you have any questions, call us at +91 9783744554 or fill the contact form at the end of this page. Let’s say that you want to book our 12 seater tempo traveller for a 4 days tour of Manali from Delhi. And the fare for our 12 seater tempo is Rs 18 per km/ minimum per day fare for 250 km. Thus Rs 18,000 will be the minimum tempo fare you have to pay us. This map tells you that one side distance from Delhi to Manali is 538 km. So a round trip will be 538 km x 2 = 1076 km. Plus, add extra 100-150 km which will cover all the sightseeing in Manali & nearby. So, a total of 1076 km + 150 km = 1226 km approx will be the total km driven on a 4 days Delhi-Manali tour. Driver allowance: You need to pay Rs 300 per day to the driver, as his allowance. So for 5 days, this allowance will be Rs 1,200. Parking charge: Throughout this 4 days tour, where ever we have to park the tempo near a tourist spot, you need to pay that parking. We suggest keeping a maximum of Rs 500 per day as parking expense. So, Rs 2,000 for 4 days as maximum parking charge for 4 days..
And to make the above three expenses calculation simple, we suggest counting Rs 1,000 per day as expenses for Driver allowance + Parking + Toll/ state tax. A total of Rs 4,000 for this 4 days tour. Rs 22068 tempo fare + Rs 4000 all expenses = Rs 26,068 – no hidden cost. 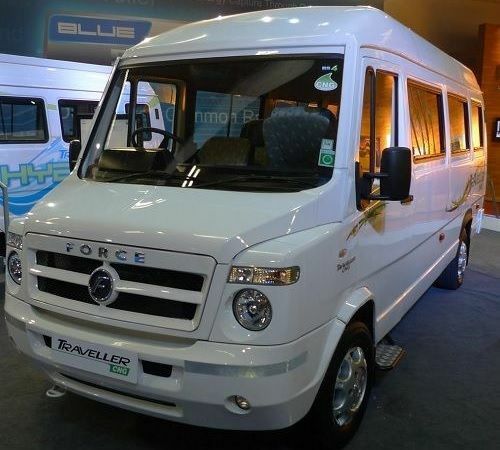 Click here to head back to our Tempo Traveller Offering page, or contact us at +91 9783744554 and also via mail, by filling the contact form below.